Specific parts of a discussion or communication among or between members of the Board and officers and employees of the Federal Reserve System. The Audit the Fed bill removes these four exemptions and is supported by nearly 75 percent of the American people. Congressman Thomas Massie (R-KY) introduced Audit the Fed, H.R. 24, in the 114th Congress on January 6, 2015, on January 3, 2017 in the 115th Congress, and on January 3, 2019 in the 116th Congress. The bill currently has 58 bipartisan cosponsors. The Senate held a stand-alone vote on Audit the Fed, S.2232 on January 12, 2016. The bill failed to reach cloture by a vote of 53-44, a largely party-line vote. Senator Rand Paul (R-KY) introduced Audit the Fed, S.16, on January 3, 2017. On January 16, 2019, Sen. Paul introduced S.148. The bill currently has 7 cosponsors. In the past, Ron Paul’s “Audit the Fed” bill, H.R. 1207, gained 320 cosponsors and passed the House as an amendment to the Dodd/Frank "Wall Street Reform and Consumer Protection Act," before being stripped out in the Senate and replaced by a limited, one-time audit of the Fed's emergency lending operations during the financial crisis. Later, Audit the Fed was reintroduced in 2011 as H.R. 459, gained 274 cosponsors, and passed the House of Representatives in the 112th Congress on July 25, 2012, by an overwhelming three-fourths majority of 327-98 after a nationwide grassroots mobilization effort led by Campaign for Liberty. After Ron Paul's retirement from Congress, Rep. Paul Broun (R-GA) reintroduced Dr. Paul’s Audit the Fed bill as H.R 24, “The Federal Reserve Transparency Act of 2013,” in the 113th Congress. The bill, which was cosponsored by 224 Representatives, passed the House of Representatives on September 17, 2014, by a vote of 333-92, with a majority of Democrats voting in favor of the bill. Senator Rand Paul (R-KY) introduced companion legislation in both the 112th and 113th Congresses, which gained 37 and 32 cosponsors, respectively. Then-Senate Majority Leader Harry Reid refused to allow Audit the Fed to be brought to the floor, in either Congress, for a vote, despite repeatedly calling for an audit of the Federal Reserve throughout his career. First things first, sign your Audit the Fed petitions urging your U.S. Representative to cosponsor and seek a roll call vote on H.R. 24 and urge Speaker Nancy Pelosi to schedule a roll call vote. Do My U.S. Representative and Senators Support Audit the Fed? Good question. To find out, visit Congress.gov HERE to see if your representative has cosponsored H.R. 24. It currently has 58 cosponsors (218 needed for a majority). Then, visit Congress.gov HERE to see if your senators have cosponsored S. 148. It currently has 7 cosponsors (38 needed for a new cosponsor high). In 2015, to bypass a stranglehold placed on S. 264 in the Senate Banking Committee, S. 2232 was introduced on 11/3/2015. It had 24 cosponsors before receiving a vote on January 12, and though Harry Reid successfully led a filibuster of it, the vote was a milestone as it marks the first time Audit the Fed has received a majority in the U.S. Senate, 53-44. What is Audit the Fed? If you haven't yet, LIKE us on Facebook and Follow us Twitter for the latest updates on Audit the Fed and C4L's other efforts. 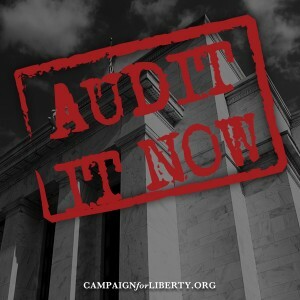 Be sure to sign your Audit the Fed Petition and demand a vote! Unlike the Federal Reserve, Campaign for Liberty can't just print money out of thin air to pay for our programs. We rely solely on voluntary contributions from our generous supporters to fund our efforts. After you've signed your petitions, please chip in $10 or $20 today to help us spread the word about Audit the Fed.